German low-level radioactive waste – could this be the first wave from outside the US? Earlier this week, NPR reported on the anticipated arrival of nearly 1,000 tons of nuclear waste from Germany at Oak Ridge, TN. The Nuclear Regulatory Commission approved a plan in June for an American company to import and burn low-level nuclear waste from Germany. The radioactive residue left over from the process will be sent back to Germany for disposal. That’s a lot of travel for waste, and Germany isn’t the only country looking for means of disposing of its radioactive waste. Located just outside Knoxville, Oak Ridge was created from scratch in 1942 to help build the atomic bomb and has become a world-renowned center for nuclear research. Operations there generate a great deal of radioactive waste and some of that waste ends up at EnergySolutions’ Bear Creek incinerator plant in Oak Ridge. With the recent permitting of WCS in Texas, there are now four low-level waste facilities in the U.S, Barnwell in South Carolina, Richland in Washington, and Clive in Utah are the others. The Barnwell and the Clive locations are operated by EnergySolutions, the Richland location is operated by U.S. Ecology and the Texas site is operated by Waste Control Specialists. WCS, Barnwell and Richland accept Classes A through C of low-level waste, whereas Clive only accepts Class A. The Department of Energy (DOE) also has dozens of LLW sites under management which includes the Bear Creek incinerator. When you start to talking about managing the rest of the world’s waste, the German waste looks like the beginning of what could be a large flood of material from other countries. 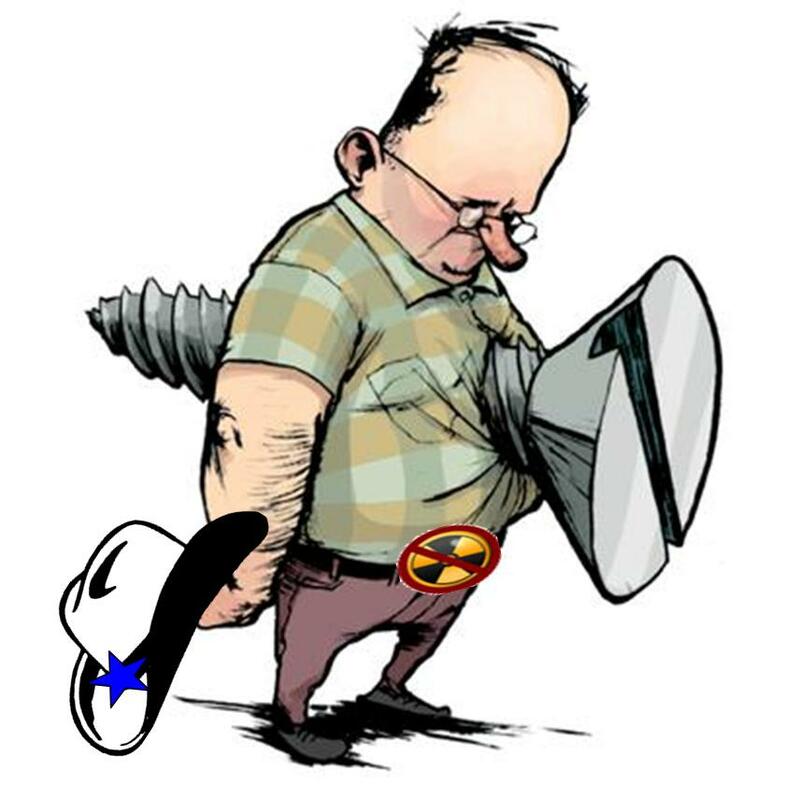 And given the blank check the Texas legislature handed WCS this past legislative session, you can bet they will be back at the table trying to get a piece of that operation. Let’s hope the Texas legislature stands firm in their resolve to not accept foreign radioactive waste, ‘cause there is a lot of it that could come our way. Facilities that process large quantities of radioactive material have the potential for significant environmental contamination due to the scale of their operations. Over time, leaks from these facilities can lead to significant radioactive contamination of the subsurface soil and groundwater. In addition, the high costs of disposing of radioactive material off-site may lead these facilities to store more waste on site, increasing the potential for subsurface radioactive contamination and significantly higher decommissioning costs. Currently these facilities are required to perform surveys to verify that radioactive releases are below regulatory requirements and do not pose public health hazards. However, the NRC believes that existing regulations were not clear enough concerning subsurface contamination. A new Nuclear Regulatory Commission (NRC) rule would now require these facilities to minimize the introduction of residual radioactivity at their sites during operations. It also requires reporting of additional details about a facilities cost estimates for decommissioning and tightens NRC control over certain financial instruments set aside to cover eventual decommissioning costs. These new regulations, which will take effect December 17, 2012, were designed to prevent future “legacy sites” with insufficient funds for decommissioning. A legacy site is a facility with an owner who cannot complete complex decommissioning work for technical or financial reasons, causing those costs to fall to the taxpayer. An unintended consequence will be that there is that much more low-level radioactive that will need to be disposed of in sites such as the Andrews County site that the Texas legislature just passed legislation on opening it up to accept waste from outside the original two state compact (Texas and Vermont). Click here to read more about radioactive waste disposal in the US. In honor of SB 1605, a Simmons‘ led bill on the Texas Low-Level Radioactive Waste Disposal Compact Commission, we decided to post a music video speaking of more sensible, viable options for clean energy. Hope you enjoy it! HB 2184 was voted out of the Texas House State Affairs Committee earlier today. HB 2184 is a piece of legislation that impacts how much, from where and how safely radioactive waste will be transported and stored at a West Texas site, and who will pay for it if something goes wrong. We’re still waiting for the final tally to come in, but it looks like through your efforts over 4,000 comments (probably closer to 5,000 or 6,000 with all of the other comments) were delivered into the Texas Low-Level Radioactive Waste Disposal Compact Commission, despite it being over the holidays. We’ve been working furiously on this issue the past few weeks, and it’s paid off. And now, a judge has ordered a halt to the upcoming meeting of the Compact Commission, putting the brakes on discussion of the importation rule. Stay here for an update, but huge thanks to everyone who submitted a comment and worked so hard on this, especially our friends at CREDO Action who got so many of the comments in!! Special thanks to Sierra Club for their hard work on this as well. Let’s keep this crazy train rolling into 2011 and make our new year nuke-waste free. AUSTIN – Environmental groups today asked the U.S. Nuclear Regulatory Commission (NRC) and the U.S. Environmental Protection Agency (EPA) to investigate the radioactive waste storage and disposal programs administered by the Texas Commission on Environmental Quality (TCEQ) for the West Texas radioactive waste site owned by Waste Control Specialists (WCS). The groups say the TCEQ has failed to protect public health, safety and the environment by repeatedly and brazenly abusing its legal authority and disregarding warnings of its technical staff about the site’s hazards. Further, citizens have not had adequate opportunities to participate in the licensing processes. 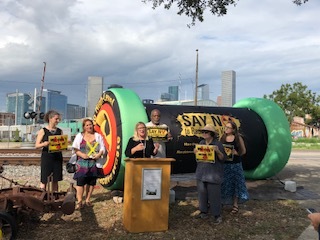 The groups are calling on the NRC to consider terminating or suspending the TCEQ’s authority to regulate the storage and disposal of low-level radioactive waste and radioactive byproducts in Texas. The groups also are asking the EPA to review the potential impact on the water supply and take action if necessary. Read the full release, the request to NRC and EPA,and supporting documents online at www.TexasNuclearSafety.org. 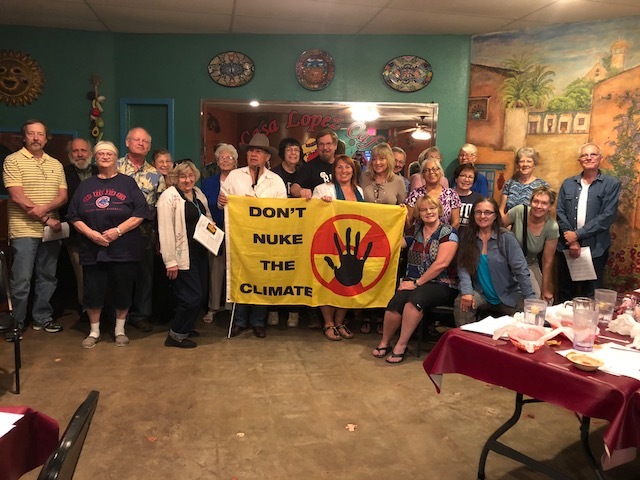 The request was filed by Public Citizen and the Lone Star Chapter of the Sierra Club, along with State Representative Lon Burnam (Texas House District 90), and individuals from Andrews, Texas and Eunice, New Mexico, who live near the WCS facility in Andrews County. The matter is urgent because WCS has been pushing the Texas Low Level Radioactive Waste Disposal Compact Commission to let it import radioactive waste from at least 36 other states. Some of the hottest radioactive waste that exists, including nuclear reactor containment vessels and poison curtains that absorb reactor radiation, could be buried in the proposed radioactive waste dump. 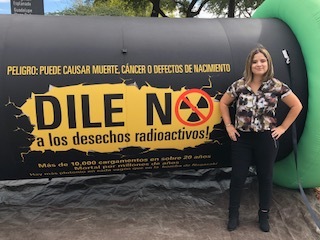 There is not a single radionuclide that can’t go to the so-called ‘low-level’ site, and many of them remain hazardous for literally millions of years. Radioactive waste dumps around the country have leaked. Cleaning up contaminated groundwater is difficult and expensive. Texas taxpayers could be on the hook for clean up costs if the site and groundwater become contaminated or if there are transportation accidents. Go to www.TexasNuclearSafety.org to learn more. At a time when lax regulatory oversight has contributed to such catastrophic problems for our nation as the financial crisis and the BP oil spill, Texas may be in the process of setting itself up for a fiscally disastrous and environmentally catastrophic future – all because of a vote by an appointed committee taking place out on the dusty, lonely edges of West Texas. A new poll shows 70% of Texans oppose importing radioactive waste to Texas for storage in Andrews County. Yet a crucial vote on a new rule by non-elected members of a commission could make Texas into the radioactive waste dump for the nation, and perhaps the world. 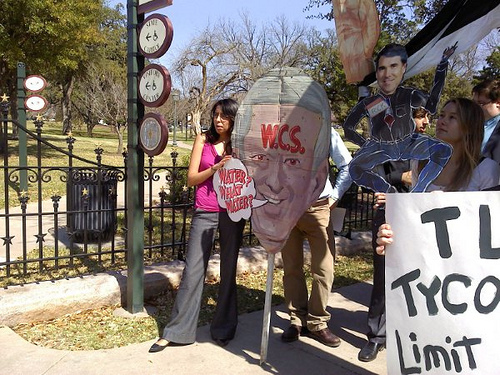 Originally only Texas and two other states could send radioactive waste to West Texas. 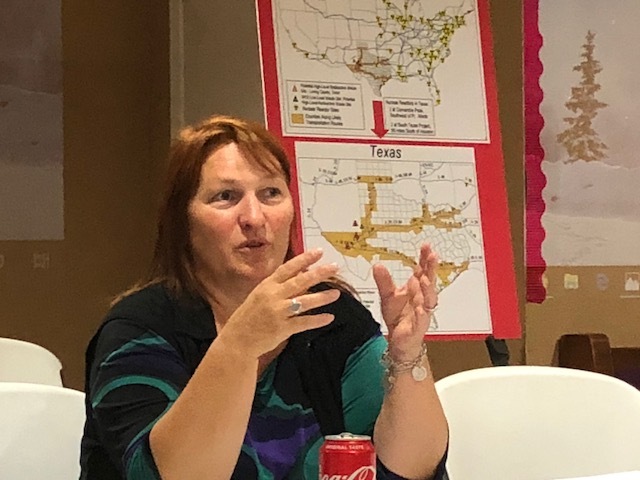 Now a rule proposed by the Texas Low-Level Radioactive Waste Disposal Compact Commission would let Waste Control Specialists (WCS) dump radioactive waste from 36 or more states, and potentially from around the world, in Andrews County. This is not what anyone bargained for – even the legislators who approved the original Compact Agreement. With a possible vote looming on the horizon (tentatively scheduled for May 11th), yesterday the Texas League of Women Voters, Public Citizen, the Lonestar Chapter of Sierra Club, and the SEED Coalition sponsored a webinar to provide expert information on radioactive waste importation for city, county and state leaders. In addition to featuring experts on radioactive waste disposal the webinar panel included Representatives Lon Burnham (D-Ft Worth) and Robert Talton (R- Pasadena). Coincidentally, this morning we learned the Commission has canceled their May 11th meeting stating publically that they are unable to deal with the over 2,400 comments they received on the rule in time for the meeting.